The Princess Royal flew in to Gresham’s School by helicopter at the weekend to officially open its new music school, the Britten Building, and to hand out prizes at the annual Speech Day celebration. Her new role as The Prime Warden of The Fishmonger’s Company also means she is Gresham’s Ex Officio Governor and she was met by an excited group of Pre-Prep and Prep pupils as she made her way to the School’s Memorial Chapel to enjoy a service for Upper Sixth leavers and their parents. 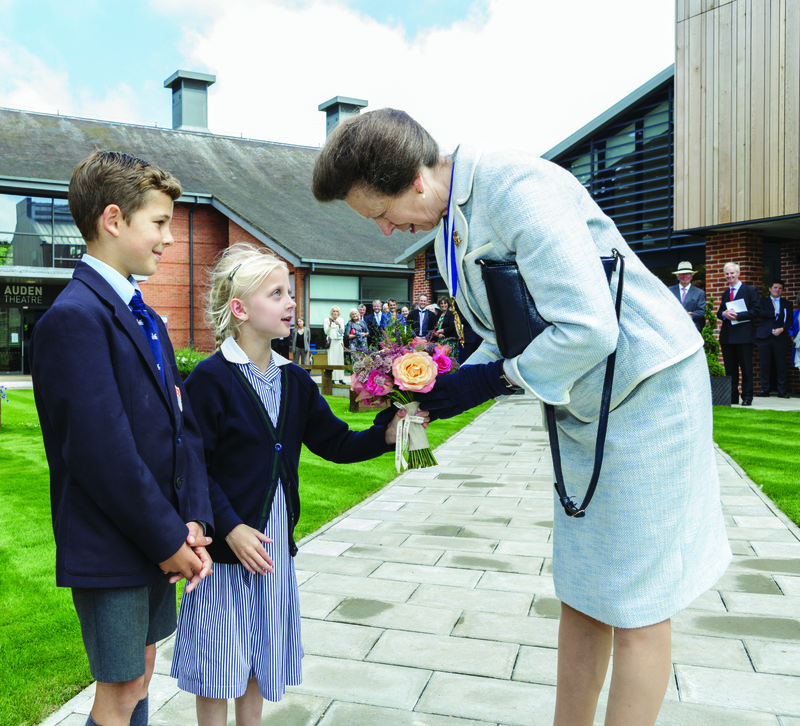 To commemorate the opening of the Britten Building, she planted a tree and, after a tour of the building and time spent chatting to donors and school governors, she unveiled a plaque in the building’s foyer. Speeches took place in the School’s Theatre in the Woods, attended by pupils, parents, governors and staff. Head of school Zara Raslan and deputy head of school George Jefford both gave speeches and closed them with a musical performance. Gresham’s chairman of governors, Andrew Martin Smith, announced that Cromer-born former Gresham’s pupil, Sir James Dyson, would become a governor representing the Old Greshamian Club. Douglas Robb, Gresham’s headmaster, said: “We feel deeply honoured that HRH The Princess Royal has agreed to become a Governor of Gresham’s in her capacity as Prime Warden of The Fishmongers’ Company. She follows in the footsteps of her father and Gresham’s Patron The Duke of Edinburgh who has been a governor previously. The princess handed out prizes to 80 pupils and took the time to speak to each one in turn. After her departure by helicopter, guests enjoyed lunch and many stayed to watch a ‘Staff vs Leavers’ cricket match. This entry was posted in Holt, Home Page and tagged Britten, gresham's, Holt, Princes Royal, Princess Anne, speech day on July 5, 2017 by Gay Webster.